I’ll be happy to sign a book for you! 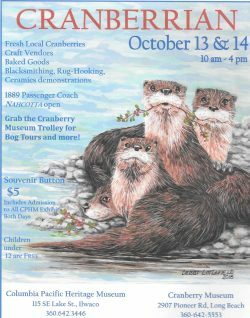 The 2018 Cranberrian Fair is in full swing at the Cranberry Museum on Pioneer Road in Long Beach and at the Columbia Pacific Heritage Museum on Lake Street in Ilwaco. Come on down! Watch the harvest! Buy bags of fresh cranberries! Or a cranberry quilt. Or a cranberry T-shirt. Or… you name it! If it has anything to do with the bright red berries that our Peninsula is famous for, you’ll find it at the Fair. Plus, I’ll be signing my latest book, Washington’s Cranberry Coast from Arcadia Press. It’s chock-full of photographs, both historic and contemporary — 176 of them, in fact! And everything you ever wanted to know about cranberry history, production, harvesting, marketing, distribution and more… You may even see or read about some of your nearest and dearest if they are involved in this most colorful local industry! I look forward to seeing you, personalizing a book or two — or even more! What could be a better gift from our very on Peninsula than some cranberry sauce (or the fresh berries for homemade) and this definitive and fascinating book! The holidays are coming! No time like the present for planning those stocking stuffers! And, besides, I look foward to visiting with you! I’ll be at the Cranberry Museum from 11 to 1 and at the Heritage Museum from 2 to 4! Hope to see you one place or the other. It’s On! The 2018 Cranberry Harvest! 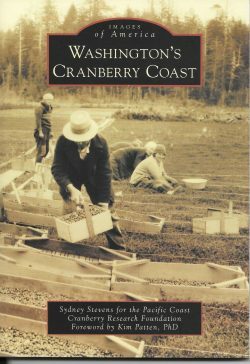 I guess I might have had more questions about that had I not recently written a book about cranberries on the Washington Coast for the Pacific Coast Association Research Foundation. Getting just the right color is an important factor for members of the Ocean Spray Cooperative. Berries are green at first and begin sizing and turning color in July and August. Due to the cool nights near the coast, the berries get much redder and darker than in any other region. West coast fruit is prized for its dark color and is often mixed with berries from other areas to make juice darker. This dark color, however, is less desirable for making sweetened dried cranberries since the finished product looks too much like raisins, I wrote. After we left the Malcolm and Ardell’s bogs, we drove by the Ocean Spray Plant. There wasn’t a lot of activity just then but there were piles of huge totes stacked up and at the ready. From another chapter in the book: Harvested berries from the Long Beach Peninsula and from northern Oregon are hauled to Ocean Spray’s Long Beach Receiving Station. They arrive in dump trucks or in trailers loaded with totes. At the receiving station, berries are moved along a conveyor belt as leaves and weeds are removed with brushes and blowers. The berries are washed and then bounced to remove bad berries. When the process is complete, they are loaded into totes and taken by semi-trucks to freezers in Forest Grove, Oregon to await processing. 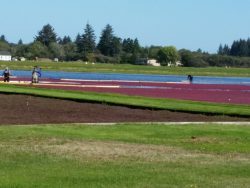 And, in case you wondered… Although the numbers occasionally change, as of 2017 there were 1,513 acres of Ocean Spray affiliated cranberry bogs on the Washington Coast (579 wet-picked and 924 dry-picked). In addition, 189 acres were grown by independent growers not affiliated with Ocean Spray. “Independents” must make other arrangements for their berries. 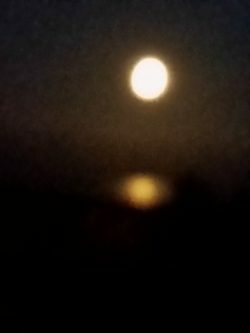 So, now that you are armed with a few pertinent facts – take a little drive around the Peninsula in the next few days. You are bound to see the harvest in progress – beautiful to watch and labor intensive for the growers and their crews. It’s the make-or-break time of year for them. We should all be clapping and cheering! And… is your calendar marked for October 13th and 14th at the Cranberrian Fair? I hope you’ll let me sign a book… personalized if you like, just for you! Please note that due to inclement weather, order processing will be delayed. Once Hurricane Florence has passed, we will begin processing orders in the order in which they were received. This announcement has been the banner headline on the Arcadia Publishing website for several days now. Their offices are located in Mount Pleasant, South Carolina which, as far as I can tell. Is on the coast directly in the Path of Hurricane Florence. It’s hard to know what to believe. I’m quite sure that we are all being inundated with mega-doses of media hype even as we see the real-time photographs of the hurricane from within(!) as well as from every other possible vantage point. It is confusing and the tendency is to blow it all off (so to speak) but of course, we can’t. 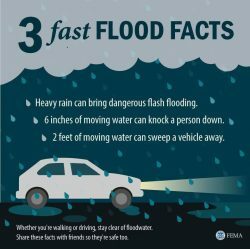 We have friends and relatives throughout North and South Carolina who, though well inland, will surely be affected by the storm. So, why is Arcadia saying it’ll be business as usual on Monday? Wishful thinking? Or are they confident that their offices will remain unscathed and that they can send out books and posters and whatever else their authors and customers are counting on? 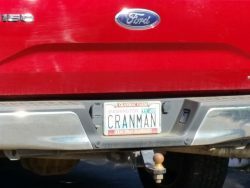 Hard to tell. 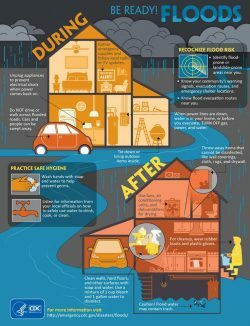 We are sending our prayers, keeping our fingers crossed, and (probably selfishly) hoping for the earliest possible return to normalcy on the East Coast. My big book signings – four of them! – are scheduled for Saturday, October 13th and Sunday, October 14th in conjunction with the Cranberrian Fair. We have a month to get the word out and maybe, just maybe, the books are already boxed up and on their way! Meanwhile, our thoughts are with everyone in Hurricane Florence’s path.